John and Jennifer Avery made history as the first husband-wife team to fly the B-2 Spirit bomber in combat during their 20-year-long careers. The couple’s joint retirement ceremony took place on September 7, 2018, at Whiteman AFB, Missouri. 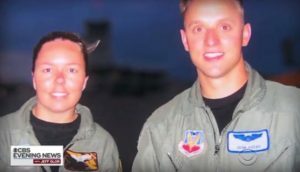 Both Jennifer and John flew in the active-duty Air Force and Missouri Air National Guard, with Jennifer logging more than 1600 hours, while John retired with more than 2,500 flying hours. “This is a thank-you for a job well done and an opportunity to highlight the history made by this couple — both individually and together,” said Col. Jared Kennish, Commander of the 131st Bomb Wing Operation’s Group at Whiteman Air Force Base. Kennish also served as best man at the couple’s wedding. Jennifer earned her pilot wings in June of 1997, which eventually took her to Ellsworth AFB, South Dakota, to fly the B-1 Lancer. She was the first female B-1 pilot to go to combat in support of Operation Allied Force in 1999. After that, Jennifer applied to fly the B-2 Spirit, based at Whiteman AFB, Missouri. Her first flight in the B-2 was on Feb. 12, 2002, making her the first woman to fly the B-2 stealth bomber. In March 2003, Jennifer flew a mission in support of Operation Iraqi Freedom, becoming the first woman to fly the B-2 in combat. Today, she is still the only woman to have flown the B-2 in combat. John earned his pilot wings in 2000, and soon was stationed at Ellsworth AFB, South Dakota, to fly the B-1. The couple got married in 2005. They have a son and a daughter. Juggling a career and motherhood was challenging, so in 2007, Jennifer decided to leave her active-duty career. After holding civilian positions at Whiteman AFB, Jennifer joined the Missouri Air National Guard at Whiteman and resumed flying as a B-2 pilot. John also transitioned to the Missouri Air National Guard at Whiteman AFB, and was selected as part of the first group of Guardsmen to fly the B-2. For the Missouri Air National Guard, the Averys exemplified what it means to be Guardsmen.